Djon Africa is about a young man, played by Miguel Moreira, who is searching for his father, but discovers a lot more. What can I say? Illnesses have a lot to do with why I’ve been late in publishing my blogs from the VIFF. However things have been getting better lately. So I can come back at it. One thing I like about going to the VIFF is I get the chance to see films that are ‘off the beaten path.’ One of which was the Portuguese film Djon Africa which was a good story to watch. The film begins with a 25 year-old Portuguese man names Miguel. He works construction during the day and is musician Djon Africa by night. He is a bit of a slacker. He was raised by his grandmother and has family roots in the African island of Cape Verde. However he doesn’t feel at home in Portugal. He’s asked about his father and his grandmother often says ‘a bit of a player and a scoundrel.’ One day he goes clothes shopping with his girlfriend and a storeowner suspects him of shoplifting. Racism? One day he comes across a good amount of money. He makes the decision to travel to Cape Verde in search of his father. The problem is he has nothing to go with. He doesn’t know what his father’s name is, which town he lives in or who his family is, other than a sister who lives in the capital city of Praia. Nevertheless he is determined. During the flight, Miguel already begins envisioning the Cape Verde he knows nothing about by dreaming of the stewardesses dancing in the aisle. Then Miguel arrives in Praia, the capital city of Cape Verde. Even as he gets off the plane, he notices how more picturesque Cape Verde is in comparison the Lisbon. The first place he goes to do his search is visit his aunt. Unfortunately he hears the bad news from family in mournful prayer that his aunt has been deceased for a year. He learns the aunt has family in Taffaral, but when he gets there, he learns he’s possibly in the wrong Taffaral; Cape Verde has two Taffarals. To make the search more frustrating, Miguel loses a lot of his belongings after a night of getting intoxicated on Cape Verde’s firewater liquor grogue. During that time of island-hopping from place to place, he comes across the natives in various ways. He comes across a lot of younger girls who have taken aback with his dreads and even call him ‘Bob Marley.’ He comes across a goat-herder Maria Antonia who impulsively gets him to work her land. He agrees. One can sense that Miguel is losing focus in his search for his father and has started falling in love with the country he never knew. Then he gets a phone call from Portugal. It’s his girlfriend back in Lisbon telling him she’s pregnant. The film ends with one final image of Miguel walking the street. It’s a common story to see sons search for their father. We see it time and time again. However this does have its own way of telling the story. The biggest ingredient is the land of Cape Verde and the people themselves. The people that Miguel come across, the places that he visits, they make for Miguel’s time here and are key to changing him as a person. It’s even people like the farmer who teach Miguel to be responsible. The meeting face-to-face with his father doesn’t happen, but I believe it was the intention of the film to be a lot more than that. One thing about the film is that it gives a lot of charming images of Cape Verde: of the people, of daily life, of the geography. All of which play a role as it is part of Miguel’s experience in Cape Verde as he tries to find his father. During the time he learns a lot about where his father comes from even though he hasn’t met him face to face. Miguel even learns more about himself. SPOILER WARNING: DO NOT READ ANY FURTHER IF YOU DON’T WANT TO KNOW THE ENDING: The ending where you see Miguel walking down the street will get you wondering. Especially since it’s after his girlfriend calls Miguel to let his know she’s pregnant. Sure, we simply see Miguel walking down the street, but it does get you wondering. Will Miguel be like his father that he decides to stay in Cape Verde? Miguel has sure come to embrace the island. Also that image where Miguel walks down and an older man in dreads looks back: possibly his father. It may give you the idea that the two may meet someday soon. Maybe it’s best that the movie end there, with the two not meeting and with it being unclear Miguel will return to Portugal for his girlfriend. They say film should leave people asking questions instead of getting answers. Top notes go to directors Joao Miller Guerra and Filipa Reis. The personal couple are most experienced in making documentaries and short films. Here you can sense that the story is told documentary-style as Miguel learns something new every day and grows as a person. Also worth admiring is the performance of Miguel Moreira. He doesn’t do any over-the-top drama in his acting. His acting is all about growing inside as a person, and we see that in the film. Also deserving high recommendation is cinematographer Vasco Viana. The images of the geography of the land and the people are very key in this personal story of Miguel. Vasco delivers excellent images that help make the story. Djon Africa may come across as a boring film at first, but it’s a story about personal growth. You have to see it to understand it, as well as understand the ending. It’s right there on FIFA’s website on how much it took to determine the 32 qualifiers for next year’s World Cup: thirty months, six confederations, 209 teams, 868 matches played, and 2454 goals scored. All 31 available berths up for grabs were decided by November 15th. December 1st was the day to decide the four teams for all eight groups for the World Cup. Qualifying for the World Cup is already enough of a battle. The respective continent’s confederations contested their matches and conducted their own qualifying format for deciding their qualifiers for the World Cup. There were even two countries that qualified via a ‘wildcard’ berth where they’d have to play a team from another continent twice. The thirty-two qualifying countries were all decided more than two weeks ago. The qualifying rounds made a lot of news for those that qualified, but those that didn’t got a lot of news of their own too. The second-round qualifying matches for the CAF saw two of Africa’s best-ever teams–Nigeria and Cameroon– pitted against each other. Only one can qualify and it ended up being Nigeria. Another surprise was the Ivory Coast being surprised by Morocco and Ghana being overtaken by Egypt. Asia didn’t have many surprises, but Qatar finished last in the Second Round group. Not good since they will be hosting in 2022. The CONMEBOL almost saw the non-qualification of Argentina, but they recovered to win their last game and qualify. Instead the most shocking non-qualifier was 2015 and 2016 Copa America winner Chile which was third the day before the final game for all teams. The biggest shockers in qualifying came from the CONCACAF and Europe. On the last day of CONCACAF qualifying, all the USA needed to do to qualify was beat Trinidad and Tobago in their last game. It was something they could do as Trinidad would finish last of the Final 6. Instead the USA lost 2-1. That was enough for them to kiss their qualification chances goodbye as Panama beat Costa Rica 2-1 to qualify and Honduras beat Mexico 3-2 to earn a berth in the interconfederation playoff against Australia. Europe had some of the biggest shockers as The Netherlands didn’t even qualify for a UEFA playoff round and Italy thwarted their playoff against Sweden losing 1-0 the first game and a scoreless draw the next. Russia 2018 will be the first World Cup since 1958 in which Italy didn’t qualify and only the third World Cup ever with Italy absent! Now enough of this World Cup’s also-rans. On with those that qualified. Twenty of the 32 teams for Russia 2018 played in Brazil 2014. Brazil makes it 21 for 21. All former World Cup winners except for Italy will be present. The team with the longest absence making a return to the World Cup stage in 2018 is Peru whose last World Cup appearance was back in 1982. There are only two countries that will make their World Cup debut in Russia: Iceland and Panama. Iceland is especially noteworthy as it has become the first nation with a population of less than 1 million to qualify for a World Cup! Actually there aren’t even half a million people living in the nation of Iceland so that makes it even more remarkable. Now onto the draw. The draw was held Friday at 18:00 Moscow time at the Kremlin. Legends from all eight countries that have won the World Cup in the past were present: Laurent Blanc, Diego Maradona, Gordon Banks, Cafu, Miroslav Klose, Fabio Cannavaro, Diego Forlan and Carles Puyol. Gary Lineker was host of the event and Russian legend Nikita Simonyan was also part of the event, Vladimir Putin was defintely in attendance, an d the Igor Moiseyev Ballet provided the performance before the draw. Now onto the actual drawing. In the past, FIFA has organized the pots to give appropriate correlation with continents and availability. FIFA wants the eight groups of four to be a case of no more than two European teams and only one team of the other confederations. There are fourteen European teams (UEFA) including host Russia, five South American teams (CONMEBOL), three teams from North and Central America and the Caribbean (CONCACAF), five African teams (CAF) and five teams from the AFC (Asia and Australia). So those are the groups for the 2018 FIFA World Cup. It makes for some interesting analyses. The draw usually tries to make for the host nation to have an easy time qualifying to the knockout phase. Russia has a good group with only Uruguay looking to be a real threat to them. Group B is most interesting not because of the challenge of the teams, but of the geography: Spain, Portugal and Morocco! The draw was aimed so that there could be better parity among ranked teams, but there are possibilities of a ‘Group Of Death’ or two. First bet is Group D; Croatia and Iceland are underdogs that can cause a surprise, and Nigeria meet Argentina for the fifth time out of six World Cups. The second potential Group Of Death could be Group F with Germany and Mexico plus possible upsets coming from either Sweden or South Korea. And there you go. That’s the Final Draw for the 2018 FIFA World Cup. The teams now have six months to prepare themselves and be among the top two to advance. Lots of excitement guaranteed. The stage was set Friday to decide the eight First Round groups for next year’s FIFA World Cup in Brazil. You could say it took a lot to determine the 32 countries that qualified for the 2014 FIFA World Cup: thirty months, six confederations, 204 countries or teams, 820 matches, and a total of 2303 goals to decide the 31 berths up for grabs. Finally on November 20th, all thirty-one berths up for contention were all decided. However deciding the eight groups of four for the Group Stage was also another tricky matter. Yeah, just when you thought it would get easier. Yesterday, the eight First Round groups were decided at the Costa de Sauipe resort in Bahia. It was broadcast live around the world. I myself saw the live telecast at 9am my time. The draw to form the eight groups for each World Cup involves a process with a lot of thought: four countries per group with continental separation. That would mean each continent other than Europe would have only one of their countries in a First Round group. Europe by means of fielding thirteen berths this World Cup would have a maximum of two countries per group. That’s always been the case since the World Cup expanded to 32 countries back in 1998. The CONCACAF (North and Central America, Caribbean): Costa Rica, Honduras, Mexico, U.S.A.
That list of qualifiers does provide for some interesting notes. Australia has played for the Asian confederation (AFC) since 2006 because of its superiority in Oceania’s confederation (OFC). Also Spain, the defending World Cup nation, still had to play qualifying matches as the defending World Cup team no longer qualifies its own automatic berth: a FIFA rule in effect starting with the 2006 World Cup. There always was a seeded pot for drawing groups for the World Cup that would involve a complicated system involving a multitude of ranks, previous World Cup places and other factors. This time around the seeding was just on that one FIFA ranking list. Sure, it was odd to see countries normally not amongst the top seeds like Belgium and Switzerland in the mix but finally creating a seeded pot was that simple. The pots meant for continental separation amongst the groups were not that easy. One easy element was that Pot 3 consisted of teams from Asia and the CONCACAF: continents that both fielded four berths. As you could tell, the seeded pot consisted of three South American teams and four European teams. That’s where complications and confusions would arise as Pot 2 would consist of Africa and South America. Pot 2 ended up with seven countries since three of South America’s five berths were seeded teams. Pot 4 consisted of the nine non-seeded European teams. So how do you solve this problem of those pots with the continental maximums? Draw one European team from Pot 4 and place into Pot 2 for four even pots of eight with the teams assuming the first position of their group. Draw from Pot 1 to decide the first teams for Groups B to H.
Draw amongst the four seeded South American teams and place the drawn out team in auxiliary pot ‘Pot X’ for the sake of continental separation. Place the European team drawn out of Pot 3 with the South American team from Pot X. 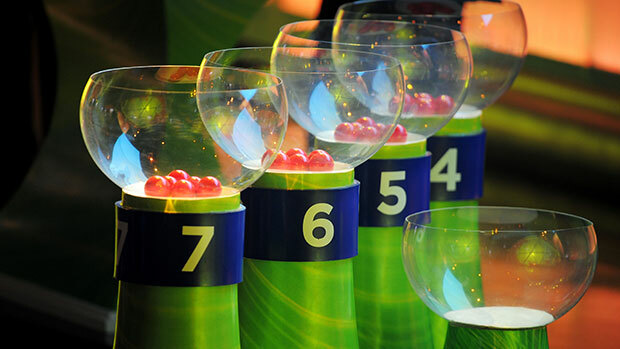 Draw from the remaining pots to determine the other qualifying teams. After the Pot 1 teams were drawn, draw the positions of the teams of the other three groups as the draw goes group by group. Yes, it’s hard to make sense. It’s hard to explain. And it’s hard to make it all work out. It’s not like the last World Cup where there were five seeded European teams and you’d easily have a European pot of eight. Nevertheless it was accomplished. The European team from Pot 3 that was drawn out first was Italy. The seeded South American team that was put into Pot X was Uruguay which was already drawn to Group D. That would mean Uruguay and Italy would both be in the same group. The remaining teams would also be drawn out evenly. The group set-ups sure have gotten a lot of people talking. Some people have noticed that some groups are so tightly put together, it’s hard to declare the one group to call the ‘Group Of Death.’ Some are stating it’s Group D with Uruguay, England and Italy. Some are saying it’s Group G with all four of its teams being top contenders. Some are even saying it’s Group B with their very first match—Spain vs. Netherlands—a re-contest of the 2010 World Cup finalists. Whatever the situation, all 32 teams have to be ready to face their Group Stage opponents and put their best foot forward if they want to advance and be the last team standing that wins the 2014 World Cup. The world will be watching from June 12th to July 13th. I myself will be doing group-by-group reviews on my blog in the weeks leading up to the start. Stay tuned for more action. 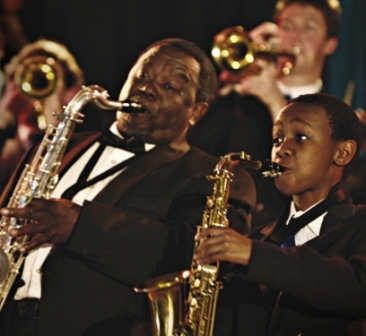 Hlayani Junior Mabasa (right) plays Felix, A South African boy with jazz dreams. The last film I saw from the Vancouver Film Festival repeats was Felix. Felix is an entertaining movie of a South African boy with musical talents. How entertaining is it? Felix Xaba is a 13 year-old Zulu boy gifted in music as he’s an expert at the pennywhistle. He lives in a Zulu area of Cape Town. His mother Lindiwe or ‘Lindy’ wants her children to have the success she never had so she is able to get Felix accepted into an exclusive all-boys prep school. This comes thanks to the help of Mr. Soames: a rich white man whom Lindy is his maid and is a former graduate of that school. Fitting in is not that easy especially since there is a lot of elitist attitudes amongst some of the richer boys of his classrom, especially Junior whom he ranks Felix as NOCD: ‘Not Our Class Dear.’ A punch from Junior during rugby practice leaves Felix with a bad first day. Further ostracism is felt days later when Felix is mocked for his green bag. Felix does find his way. He does make friends with the big but shy Ricardo and the awkwardly friendly and goofy Samuel. They’re frequently at odds with the ‘elite’ clique of Junior, Marshall and Rocky. Felix wants to make the school’s jazz ensemble but can’t with the pennywhistle. Jazz music however is discouraged by his mother. She calls it the ‘Devil’s Music’ and believes if Felix pursues it, he will be like his late father, whom she refers to as ‘useless’ in front of her children but secretly still loves him. The children soon learn Lindy still loved their father when they come across the ‘evil chest.’ They learn it’s not evil at all. In fact it has memories of their father: various pictures, magazine articles of him and his band the Bossa Boys and even his own saxophone which Felix tries to play to make the jazz ensemble. Felix tries to re-audition for the jazz band. During the wait, he finds help in learning to play the saxophone from Bra Joe, a former member of the Bossa Boys. All lessons have to be secret because he knows his mother will get angry at him for learning jazz and has a certain hatred to Bra Joe. Actually Lindy has a reputation of being the village snob. The one place where she is friendly is with her church choir. Through Bra Joe, Felix is able to learn to play the saxophone, learn sheet music and learn about his late father. Everything turns upside down when Lindy learns Felix went into the chest and took the saxophone. She then pawns the saxophone. To get it back, the Bossa Boys hold a reunion concert that’s a benefit concert for Felix. The Bossas try to get the villagers to attend and Ricardo and Samuel try to get schoolmates and their families attend. The concert comes and theplace is packed with villagers and schoolfriends alike. , Felix and the Bossas put on a great show and the money is raised to get Felix’s saxophone back. However it comes at the expense of Lindy as she disowns Felix. The final act comes after Felix succeeds in re-auditioning. He’s able to impress his strict instructors and he’s eligible to perform in the upcoming show where he has a solo part and a performance with the Bossas. Everybody involved with the school is coming, even Mr. Soames. But Lindy refuses. She still stubbornly disowns Felix. Only time is running out. This leads to an ending that is somewhat predictable but enjoyable nonetheless. This is a very enjoyable family movie that succeeds in being entertaining without being overly ridiculous. There are some times when the movie does tread on some things like racism and the hard times of apartheid but it succeeds in not making it too heavy for the sake of it being a family movie. Actually the movie is shown mostly of blacks and whites conversing and getting along quite well in the movie. Even Mr. Soames treats Lindy like a friend instead of his maid. The movie does remember to portray the South Africa of today. Even scenes where there’s talk of the death of Felix’s father, including that scene where Felix asks Bra Joe why his father drank himself to death, came across as not too harsh as not to ruin the family-friendly atmosphere of the movie. If there was one issue this family friendly movie focused on most, it was classism. It does show the separation between the rich and the working-class. It’s evident in Junior and his clique labeling outsiders as NOCD. It’s evident as one of the schoolmasters thinks that being labeled ‘elitist’ is a good thing. It’s also evident as one member of Junior’s clique, Marshall, is black coming from a wealthy political family and he treats Felix as an outsider. It also shows about the sometimes unfair world about privilege. It’s first evident not necessarily in the school but with Mr. Soames as he shows Lindy his tie from the school and says: “This opens doors.” Even Lindy’s attitude as she struts around her village thinking she’s too good for the village and she’s going to get her children out by sending them to prep school is another example of the theme of elitism. Nevertheless it’s Felix and his musical pursuits who shows that class is another border music can cross and actually unite the classes together in harmony. Without a doubt this is a family movie that follows a familiar formula. It’s a child coming of age and doing what’s in his heart and desire despite the opposition of a parent. I’ve seen the formula before. The only way for a film like this to succeed is if it does the story right and if it makes you want the protagonist to win in the end. The movie does more than just simply make us want Felix to perform at the jazz recital despite Lindy’s opposition. The movie also wants to make the mother heal from the loss of her husband. We know that Lindy secretly still loves Felix’s father despite drinking himself to death. We also know the real reason why she considers jazz music evil: because she blames it for her husband’s death. The movie’s story succeeds in being a risk-taker in the plot. Felix’s pursuit of jazz, especially through playing his late father’s saxophone, could either help her heal from the pain or make it worse. That adds friction to both sides of the story. It’s something that not even Mr. Soames having tickets to Felix’s recital can soften Lindy’s heart. For all intents and purposes, this is a feel-good movie that did all the right moves. There were many instances in the movie where the feel-good moments would normally come off wrong or ridiculous but it did things right. Some may feel the ending of it to be too fluffy or sugar-coated but we shouldn’t forget that this is intended to be a family movie. Besides name one classic family movie with a sad ending. This is yet another example of countries trying to lean more towards creating movies and maturing past making simply films. And it’s not just simply making a movie loaded strictly with entertainment elements. They want to put effort into the story and deliver a professional winsome product. Felix is a good example of the South African film industry doing so. And it’s not just any type of movie but a family movie. Film industries around the world have always tried to make family entertainment. Very rarely does one stand out and catch the world’s attention. Felix appears poised to do just that. Right now making live-action family movies is in a bit of a slump for Hollywood. It’s been a while since they’ve shelled one out that has fared well at the box office. Most family movies that have fared well in the last few years have been the animation movies. Felix doesn’t feel the pressures of Hollywood. The South African film industry is an industry that has little to lose and everything else to gain. A movie like Felix can gain a lot if distributed internationally. I see a lot of elements in the movie that can allow this film to excel internationally whether it be on the big screen or DVD. It just has a lot of charming ingredients that succeeds in entertaining. The biggest accolades has to come from Hlayani Junior Mabasa for playing the musically gifted Felix Xaba. He was entertaining from start to finish and never let go of his scenes. Lina Sokhulu was also very believable as Lindy. She had to personify a woman with many different personalities: struggling, confused and hurting. She delivered a performance that was very well without interfering with the family-friendly atmosphere of the movie. Thafelo Mofokeng was also very good as the warm Bra Joe. Actually it was Bra Joe’s easygoing personality that seemed to make the hardest issues in the movie come across easier. The ensemble of both the young actors and the older actors and musicians also worked to make it enjoyable. The thing that will surprise most people is that Felix is actually written and produced by women. It’s directed by Roberta Durrant who has an excellent resume in terms of film and television production in South Africa. In fact she has even received a Lifetime Achievement award for her contributions to film and television in South Africa. Shirley Johnson is a new writer with credentials in writing for television and stage and is an experienced actress. In both cases this is Johnson’s first time writing for a feature film as this is Durrant’s first time directing a feature film as well. Actually the script for Felix was an idea that started by Johnson back in 1995, finished the original draft in 2004 but only now came to full fruition. The end result is very professional, very impressive and very entertaining. The music ranging from the school band to the Bossa Boys to the church choir was also top notch and made the movie. Felix is a fun entertaining family movie from South Africa. It’s a feel-good movie you don’t have to feel guilty liking. Reminds film festival crowds that audience satisfaction is not a weakness in film making. When you think of singing icons, which male icons come to mind? Elvis? Bob Dylan? How about Rodriguez? Yeah, I know you’ll be asking ‘Who Rodriguez?’ Searching for Sugar Man solves the mystery for us of who Rodriguez is while the documentary plays out the fan’s mystery of what happened to him. 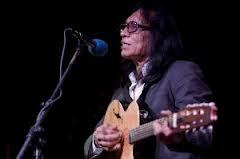 Sixto Rodriguez was a Detroit rock/folk singer from the early 70’s who wrote songs of what he saw and felt. His songs were a mix of folk and blues and he was already being touted as the next Bob Dylan by Sussex records: the record company that discovered him. He recorded two albums under Sussex but neither sold. Rodriguez was dropped in 1972. Yet another could’ve been that didn’t. That’s that, or so it seemed. South Africa had a different story. People had bought both of Rodriguez’s albums and it caught on. The fact that his album was banned in South Africa at a time where censorship was heavy increased the stigma of the album and bootleg versions came about into the hands of many more South Africans. There was even talk of his alleged onstage suicide in 1973 that increased the stigma of Rodriguez that made him a bigger phenomenon than Elvis. The problem was that there was not only a lot of censorship within South Africa at the time but a lot of censoring of media of what came out of South Africa. Nobody outside South Africa knew of Rodriguez’s phenomenon there. Not even Sussex Records, which folded in 1976. Then came the time to put Rodriguez’s music on compact discs in the 1990’s. This was done with the aid of record-store owner Stephen Segerman, who’s nicknamed ‘Sugar Man’ after one of Rodriguez’s songs, and journalist Craig Bartholomew-Strydom who had to write the liner notes to the disc. They try through pictures and through lyrics to get information to no avail. Instead Strydom wrote in the liner notes asking out for knowledge. That’s what triggered the determination to find out what happened to Rodriguez and learn more about his life. Boy were they in for a surprise. They post an ad on the internet asking for knowledge. They get more than knowledge from people that know him: they learn he could be alive. Then came the call from the man himself to Segerman. Rodriguez is alive and working as a construction worker/demolition remover in Detroit. He has been married twice and has three daughters and a grandchild. He taught his children never to feel like second-class citizens despite coming from a working class family. He even ran unsuccessfully for civic office in 1989. They’re excited but they know that all of South Africa need to know what happened to him and Rodriguez needs to know of his fame. Then he finally agrees to do concerts in South Africa in February 1998 featuring a popular South African band as his backup musicians. It’s at that moment during the very first concert that Rodriguez finally learns of his greatness and South Africans finally meet their beloved musician. After the tour, it was a return for the Rodriguez family to their regular lives and Sixto back to his construction work. Only now his co-workers know more about his fame half a world away. One thing I liked best about the documentary is that it keeps secret the fact that Rodriguez is still alive from the audience until we hear of Segerman’s phone call from Rodriguez right in the middle. Unless you have your wireless device with you at the film–and I hope you have enough manners not to use one in the theatre while the film’s running– you too will probably think that Rodriguez is deceased because you most likely wouldn’t have known who he is either. The film did a smart move in revealing Rodriguez is alive and showing us the real life Rodriguez in the middle of the film. It makes the South Africans’ mystery of the past our mystery too. Another good quality of the documentary is that it does remind you about the music industry. It’s cruel but it still decided the winners and losers whether we like it or not. We often think that the late-60’s early-70’s was the time most accepting of new sounds, most consisting or game-changers in the music scene and less pressure to conform to looks or less need for mass promotion. Rodriguez’s lack of success reminds you that even back then, promotion and typical music business procedures were necessary to even make a legend out of Rodriguez. He could have been the ‘Dylan Of Detroit’ that people described him as but his success never happened at home. And this was at a time before independent record labels or alternative radio or even before unsigned musicians could create and produce their own music and have it on iTunes and Youtube. Was the grass really greener back then? Another good addition in the documentary is the use of animation, pictures and Sixto’s music. The animation shows the images of the Detroit Rodriguez knew and wrote about. The pictures of Rodriguez during the 70’s give a good example of his personality. His music shows the darkness of the life he was living and the life he saw through his eyes. The combination of it makes this out to be something more than a simple music documentary. The people interviews for the documentary also added to it. It’s not just the two South Africans, Sixto and his family but record personnel who worked with Sixto, a South African band who idolized him and would become his back-up band during his 1998 South African tour, and even co-workers of his construction job. The documentary is not just about Sixto and the fame he never knew he had but also of South Africa and why they fell in love with his music. We should remember up until 1990, South Africa was a country under the strict rule of apartheid: the separation of races. Life was hell for non-whites but life was difficult for many whites too, especially the ones who opposed apartheid. News was censored. Entertainment was limited. And speech against apartheid even from white people was a crime punishable by 3 years in prison. You think the hippies of the late 60’s early-70’s had their things to rebel against? It was nothing compared to what the young South Africans of the time had to deal with. You could understand why censored music would attract them: because they were that disgusted with their government. They even go into South Africa’s national archives of censored music, take out one of Rodriguez’s albums that was to be the nation’s official master copy and show the scratch marks of one of his songs. Scratching out songs on albums was the censorship technique used by the South African government. The movie does not end on a completely happy note. We still learn that people other than Rodriguez are making money off of his records. We learn that Rodriguez has toured South Africa at least three more times and he has given all of his tour money to family members. He still lives in the same Detroit house he’s lived for forty years and never complained about the fame in the US he never had. In fact he’s even happy with his construction work as he says it helps keep him in good physical condition. Shows that Rodriguez is not just quite a musician but quite a person. Has my review stimulated interest in you to actually hear Rodriguez’s music? Guess what? The documentary has succeeded in stimulating interest in Rodriguez to the point that the soundtrack of the documentary has sold. This has also led to recent reissuing of his two albums in many countries including the US and even appearances on 60 Minutes and Letterman. Guess what? For the first time his music is charting in the US! In fact this very week, Cold Fact is #78 and the Searching For Sugar Man soundtrack is #100 on the Billboard Album chart. Yeah, it’s a shame that he had to wait 40 years for success of any kind here but better late than never. Searching For Sugar Man is an intriguing documentary that leaves the audient engaged in Rodriguez’s music as well as the mystery the South Africans try to solve on him. In a world full of documentaries that mostly one-sided liberal propaganda being shoved down your throat, this is a welcome relief too. I went to see it because it’s heavily favored to win the Oscar for Best Documentary. Boy did I get more than my money’s worth. Note: If you want to learn more about Rodriguez, here’s his official website: http://www.rodriguez-music.com/ You can even give your email for upcoming news and tour dates. Now if only he can come to Canada!